The December 14 massacre at Sandy Hook Elementary School devastated many Westporters. Newtown is close to home. It hit Brian and Annette Sullivan especially hard. For them, Newtown is home. For the past 20 years, Brian — a member of Staples’ Class of 1982 — and Weston High grad Annette have operated Zoar Ridge Stables. Nestled on 30 hilly acres in the heart of Sandy Hook, the facility — with 3 outdoor rings, an indoor ring and a hunt field — has long attracted riders of all abilities and ages. But children have always been Brian and Annette’s favorites. They have 2 girls of their own, and they loved the children who came to Zoar Ridge for lessons, summer camps and horse parties. The couple did more than provide rides. They taught hundreds of Newtown kids the responsibilities of owning a horse. Children were expected to help groom and pick up after the animals. It was a win-win-win situation, for the Sullivans, the youngsters and the horses too. Many Zoar Ridge kids attended Sandy Hook Elementary School. One of Brian and Annette’s students was killed in the shooting. Several others had siblings who died. It was a terrible day for the Sullivans. 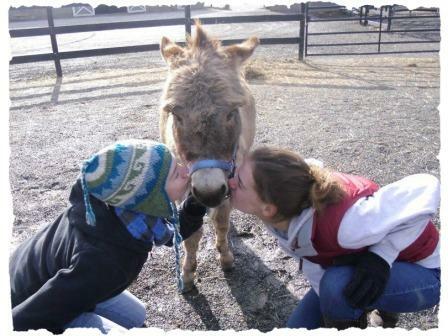 But that weekend, they opened their stable for kids to ride. “We just wanted some place where they could get away from the press, the attention — everything,” Annette says. 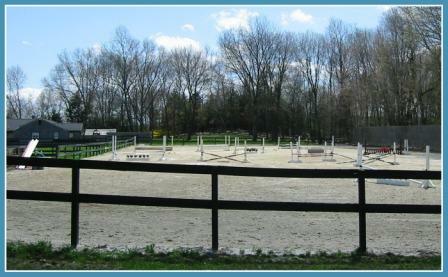 A riding ring at Zoar Ridge. As they rode, brushed horses or did crafts projects Annette organized nearby, they started talking. Some spoke about what they’d seen. Others expressed fears for their friends, or the future. She had heard about “horse therapy” — the formal term for equine-assisted psychotherapy — so she reached out, to professionals and through Facebook, to learn more. She discovered that equine specialists select the appropriate horse for each client. Working on the ground — not in the saddle — therapists guide children through customized sessions. With EAGALA — an international non-profit equine therapy organization — she worked with local resident Jimmy Downes to develop a program at Zoar Ridge. That evolved into Embrace Hope — Sandy Hook Equine Assisted Therapy, a foundation aimed at providing funds and facilities to Sandy Hook victims and siblings for years to come. EGALA teams from all over New England have helped. Nearly 20 families are involved so far. 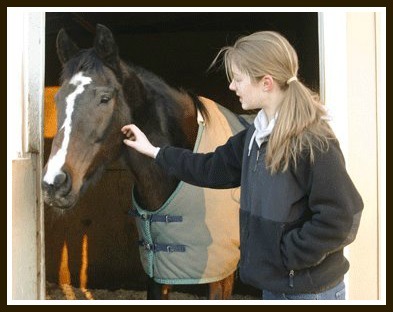 In one session, Annette says, a child was asked to lead her horse “to school.” The girl said, “But what if he doesn’t want to go to school that day?” The youngster’s fears about school were addressed by the therapist through the horse. In another session, a boy hurled balls at hoops, knocking them over. Then — petting a horse — he calmed down. One Zoar Ridge horse has only one eye. “Watching him deal just fine with life — despite what happened — is great for the kids to see,” says Annette. The Sullivans have not been immune to their own tragedy. Just before Thanksgiving in 2009, their beautiful home near the stables burned to the ground. But their Embrace Hope Foundation is the current focus of their lives. “Feeling like we’re helping the kids of Sandy Hook is huge,” Annette says with passion. This entry was posted in Children, Organizations, People and tagged Annette Sullivan, Brian Sullivan, EAGALA, Embracing Hope Sandy Hook Equine Assisted Therapy, equine assisted therapy, Miggs Burroughs, Zoar Ridge Stables. Bookmark the permalink. What a wonderful program. Thanks so much, Dan, for letting us know about it and thanks also to Miggs for the perfect Logo. Dan – thanks for the great article. Since Brian and Annette opened their farm up for those affected by the Sandy Hook tragedy, there have been people seeking help every weekend since. It is amazng to me how much they give, when they have had so much taken away. In Embrace Hope Sandy Hook we hope to create a lasting foundation that will allow Brian, Annette and the EAGALA providers to provide their services and resources for the long haul. Zoar Ridge Stables does equine rescue work, too — that is what I know them for; so I’m not at all surprised that the Sullivans care equally deeply for their neighbors and friends. Great work, Sullivans!